Medina’s beautiful, vivid prose conjures the Colombian setting with tactile language...Juana’s narration is also peppered with easy-to-figure-out Spanish words. Through this strong, adventurous, and smart female protagonist, Medina presents an extraordinary story about the many opportunities learning a new language can bring. Full-color illustrations provide excellent depictions of Juana’s life in Bogotá and allow readers to connect with her character and culture. The artwork playfully interacts with dynamic text, which often arcs across the page, employs large fonts for emphasis, and smoothly incorporates Spanish words. Fans of Judy Moody and Lola Levine will absolutely love Juana. This upbeat new series for young readers is a must-buy. As both author and illustrator, Medina is able to integrate the text and illustrations in unique ways, including spreads in which Juana tells us why, for example, she strongly dislikes her school uniform or why Mami is the most important person in her life. Font design is also used creatively, such as when Medina traces the arc of a soccer ball hit hard enough to be sent “across the field.” An essential selection that creates multicultural awareness, has distinguished and appealing design elements, and has a text that is the stuff of true literature. Both comfortably familiar (this will be an easy sell for fans of Pennypacker’s Clementine, for instance) and keenly specific in its setting and characters, Juana & Lucas is much needed for the gap it fills in American children’s literature, but it will be much beloved for its warmly depicted family relationships, eminently read-aloud- able high jinks, and sunny protagonist. Told from Juana's point of view with humor and drama, using capitalized words, periods separating words for emphasis, and a good sprinkling of Spanish words throughout, the book makes clear there's a universality to Juana's story. The ink-and-watercolor cartoon-style illustrations are charming...The real gift of this book comes from presenting a different point of reference to American children who hear only stories of poverty and need coming out of South America. A Colombian girl takes on her greatest challenge—the English language—in this cheery series opener...Medina’s loose, full-color cartoons and interspersed profiles of the people in Juana’s life add to the overall playfulness of the story. It’s an inviting look at life in Colombia, and readers will probably be struck by just how much they have in common with Juana. Juana is certain to join spunky, spirited independent young girls like Judy Moody, Junie B. Jones, and Clementine as a beginning chapter book favorite character. A twist on the value of learning multiple languages from a non-American perspective is welcomed. This delightful easy chapter book has much to recommend it: a lively and likable child narrator (entirely credible in her ambivalence about scholastic endeavors), a strong plot trajectory and quick pacing (and a page count that will pass muster with reluctant readers), and a generous number of engaging illustrations that will be in color in the finished book...Both edifying and entertaining, this solid title is a winner. The author-illustrator grew up in Colombia and draws on fond memories to lend energy and heart to the many vignettes. Juana expands a sometimes limited view of South America. 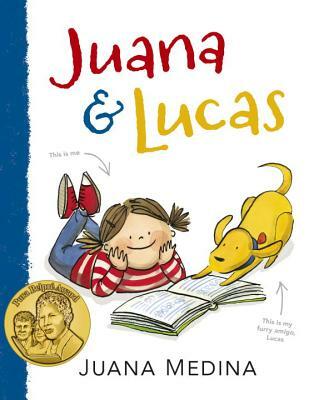 “Juana and Lucas” is the kind of book I’d like to see a lot more of.